The way the electricity grid has worked for the past century is changing. A startup at the University of Vermont is hoping they can use your household appliances to help. Even as wind and solar energy have grown to nearly 10 percent of New England's energy mix, they're still not a reliable power source. Wind and sunshine can't simply be turned on and off with a switch. A new software company is hoping to use a simple appliance in your basement — your water heater — to store that sporadic renewable energy and transform the way the electricity grid works. "The big idea is that when there is energy available, you should use it, and when there's not energy available, you should not use it, it should wait until a better time," says Paul Hines, an electrical engineer at the University of Vermont, and a co-founder of the startup Packetized Energy. It sounds simple, but Hines is describing a complex software algorithm that would reconfigure the way home water heaters work. By making your water heater "smart," it's transformed from simply being an energy-user into "a virtual battery." "So, it's like taking all these water heaters and turning them into batteries that can store surplus electricity from grid," says Hines. This story is part of The Big Switch, a special energy series from the New England News Collaborative. Explore the series here. Under the current system, your water heater turns on and off at preprogrammed times throughout the day. And, of course, it turns on after you take a shower to heat the tank back up. But what if your water heater could respond to a signal from the grid and turn on just to absorb some extra energy because all of the sudden the sun came out and solar power surged? Then, later in the day, during peak electricity use time, it wouldn't need to turn on, reducing the reliance on non-renewable energy sources like natural gas. Choreographing the timing of when water heaters turn on and off — even just by minutes — could have a real impact on smoothing out the unpredictable nature of renewable energy. In addition to being sporadic, renewable energy is also upending the way the grid works. For the past century, the grid consisted mostly of large power plants sending energy down through wires and transformers into homes. Now, bursts of wind and sun send electric surges back onto the grid — that's the reverse direction of how power has flowed for years. 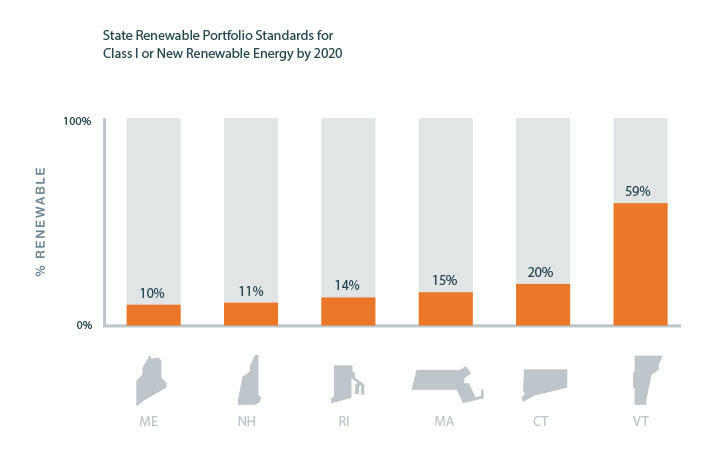 Most New England states are still far short of the ambitious renewable goals they hope to reach by 2020. An extreme example of how this can be problematic happened in Hawaii, where there were all kinds of financial incentives to build solar. "So solar panels popped up all over Hawaii — and that idea of power flowing the wrong way, that happened. It caused fuses to break and blackouts to happen in Hawaii," says Mads Almassalkhi, also a co-founder of Packetized Energy. "The system was just stressed very, very quickly." Almassalkhi says now in Hawaii, solar projects aren't allowed to be connected to the grid unless they are paired with a storage system, such as an electric battery. He's betting that this complex software algorithm choreographing water heaters can be a solution to this problem, albeit it on a smaller scale, in Vermont and elsewhere. When your water heater is heating up it typically uses three times as much energy as your whole house, says Hines. If smart software could ensure that the appliance mostly ran during times with high solar or wind energy, the potential savings are substantial. The startup founders have tested the software in computer simulations, but to see how it works in practice they're programming a much tinier version of your home water heater: electric tea kettles. 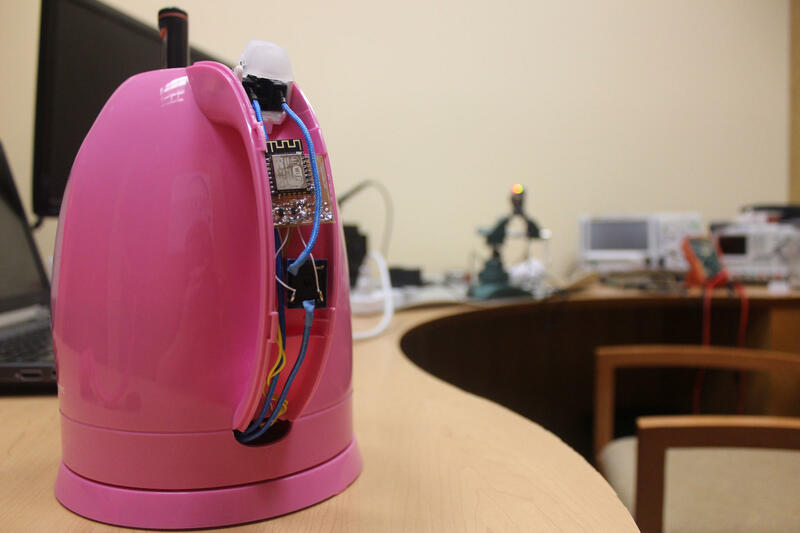 Engineer Andrew Giroux has added a $3 microchip to this tea kettle so it can both receive a signal from the "grid" and request energy. The kettle simulates a home water heater for their software, allowing them to test the system on a small scale. In a small windowless basement office at the University of Vermont, engineer Andrew Giroux has rigged up eight fluorescent green tea kettles with a $3 microchip that allows it to be turned on and off via wi-fi. "So the idea is that because we have this temperature range we want to maintain, if there's a ton of sun shining, we can crank temperatures up to higher end of the range," says Giroux. So if the software simulation tells the tea kettles, "Hey, there's a ton of power available right here — so much so that maybe the grid is just going to turn it off and waste that available wind power — we can actually turn everyone's temperatures up a bit." Then all the tea kettles will use that power "so that when a cloud comes over for the next hour in the future, we won't need that power, they'll all be up to temperature." The algorithm would prioritize using renewable energy whenever possible. Say you take a shower and your water heater wants to heat back up the tank; the software would then ping the grid asking if it's a good time to turn on. If not, it would be told to wait a few minutes, and then request again. The system is designed to allow multiple heaters to choreograph their timing so that the grid is never overwhelmed. In the tea kettle test scenario, "if you plug one tea kettle into your outlet, you're good, if you plug two tea kettles in, you will trip the breaker, and we're working to make it so all 10 can get the electricity they need without tripping the breaker." The software is designed such that your water heater's request for energy wouldn't be denied multiple times, so no one would be in the position of taking a cold shower. The startup isn’t the first to look to use water heaters to store renewable energy. 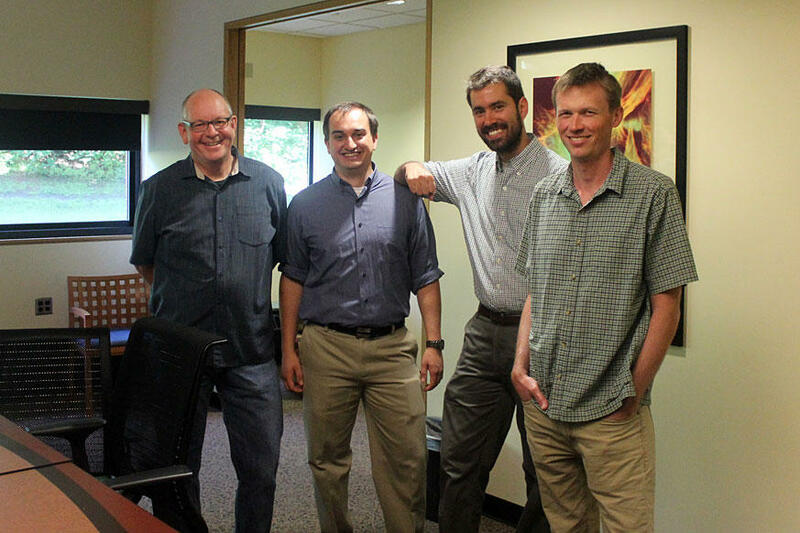 Other projects have worked to schedule fleets of water heaters to absorb excess energy from the grid, but the UVM professors are working to make their algorithm react in real-time, and work without top-down coordination. "We're not developing schedules, we're reacting in real-time to what's happening in the supply and the demand, and balancing the two,” says Jeff Frolik, an electrical engineer at the University of Vermont and a co-founder of the startup. The startup team, from left to right, Jeff Frolik, Andrew Giroux, Mads Almassalkhi, and Paul Hines, are testing their software using electric tea kettles before trying it on real-life water heaters. Frolik explains that the software is designed for many appliances to turn on where there's sun and wind, and then "if a cloud came over, the solar power dropped, then say, 'OK, everyone wait for a little bit, come back a bit later and see if the sun's back out.' And as the wind comes up and down, you're also tracking that signal." And the technology could be applied to many appliances not just water heaters, says Almassalkhi. "We've shown [that it] can be applied across a wide range of loads, we're talking about freezers, water heaters, air conditioners, electric vehicles, pool pumps," says Almassalkhi. All these micro-adjustments that either advance or delay when devices turn on have potential to effectively make much better use of sporadic renewable energy. There are still many questions left to be tackled: How much renewable energy could all these devices actually "store?" Are there enough devices that could be retrofitted and made "smart" to communicate over the grid? Is the grid equipped to handle this kind of real-time power adjustments? The UVM professors received a competitive $1.5 million grant from the Department of Energy to study all this. In a year or so, they're hoping to be ready to work with the utility Green Mountain Power to retrofit some water heaters in people's homes and test the software in the real world. Times are bright for solar energy in New England. From small projects to massive, multi-acre arrays, solar projects are both changing the landscape and transforming the way we buy, sell and transmit electricity. Yet the solar boom poses unique challenges for the regional grid, as well as for one small, member-owned utility in northern Vermont. As our reliance on solar and wind energy grows, so does the challenge of reliability: The wind and sun can’t be turned on and off whenever people need electricity. One part of the solution is energy storage.